The human eye is remarkable. It accommodates to changing lighting conditions and focuses light rays originating from various distances from the eye. When all of the components of the eye function properly, light is converted to impulses and conveyed to the brain where an image is perceived and interpreted. Light rays enter the eye through a transparent layer of tissue known as the cornea. As the eye’s main focusing element, the cornea takes widely diverging rays of light and bends them through the pupil (the dark, round opening in the center of the colored iris). The lens of the eye is located immediately behind the pupil. The purpose of the lens is to make the delicate adjustments in the path of the light rays in order to bring the light into focus upon the retina, the membrane containing photoreceptor nerve cells that lines the inside back wall of the eye. The photoreceptor nerve cells of the retina change the light rays into electrical impulses and send them through the optic nerve to the brain where an image is perceived. The individual components of the eye work in a manner similar to a camera. Each part plays a vital role in providing clear vision. CORNEA – The transparent, outer “window” and primary focusing element of the eye. The outer layer of the cornea is known as epithelium. Its main job is to protect the eye. The epithelium is made up of transparent cells that have the ability to regenerate quickly. The inner layers of the cornea are also made up of transparent tissue, which allows light to pass. IRIS â€“ Colored structure of the human eye. PUPIL – The dark opening in the center of the colored iris that controls how much light enters the eye. The colored iris functions like the iris of a camera, opening and closing, to control the amount of light entering through the pupil. 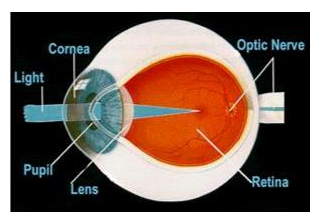 LENS – The part of the eye immediately behind the iris that performs delicate focusing of light rays upon the retina. In persons under 40, the lens is soft and pliable, allowing for fine focusing from a wide variety of distances. For individuals over 40, the lens begins to become less pliable, making focusing upon objects near to the eye more difficult. This is known as presbyopia.